In 1912 under the leadership of Elder Enoch Ross, Sr. the first church structure was better known as a Brush Arbor (often dialectically called Bush Harbor). Brush Arbor was a temporary structure which consisted of tree limbs bound together and covered with brush and bushes. Sometimes, chicken wire was used to help hold the structure together, The first church was located outside of the city limits of Terrell and was named Griffin League Church. In 1949 while under the leadership of Elder C,H, Crosby, the church journeyed to 1120 S. Medora St, Terrell, Tx, (while the new structure was under construction at 1213 Medora St. In 1960 Supt. 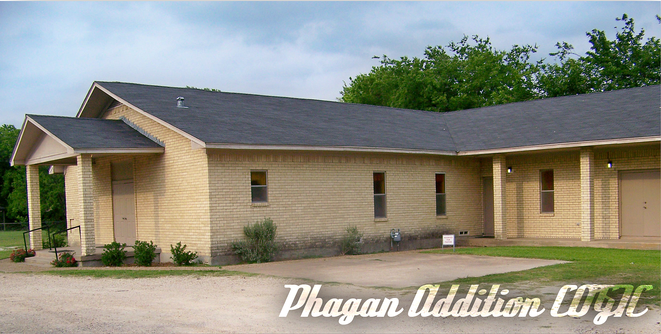 Robert Hill became the pastor and renamed the church "Phagan Addition' named after the subdivision. Due to the growth in membership a.new structure was built in 1974 just north of the previous construction at 1215 S. Medora. The facility was paid in full by 1984, in 1988 a fellowship hall was added. In 2010 under the leadership of Elder Reginald Miller, Sr. the church was renamed, "Chosen Generation" based on 1 Peter 2:9; "But ye are a chosen generation, a royal priesthood, a holy nation, a peculiar people; that should shew forth the praises of him who hath called you out of darkness into his marvelous light". On Sunday, July 1, 2012 our first official service convened at our new location 2051 Griffith Road, Terrell, Texas.